Bilston Road was built by Peter Cullen and appeared last in April 2007 at Cheltenham. Recently we requested Peter re-exhibit it with us. The news came back he was looking to sell the layout, at which point we agreed a price and purchased it without hesitation. 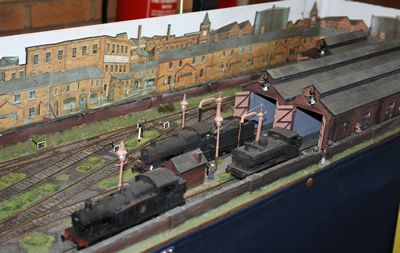 The layout represents a typical sub-shed in the industrial Midlands on the Western Region of British Railways. Locomotives return for overnight servicing and simple running repairs. Stock is mainly ready to run with some having added detail. 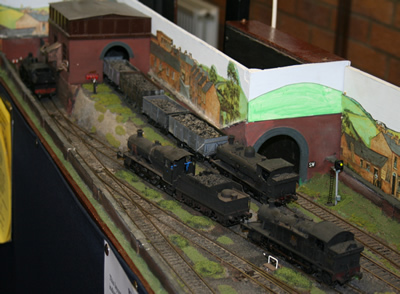 It is hoped to exhibit the layout at a later date when engines from the 1930's will be featured. 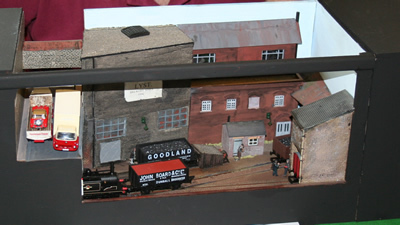 Campbells Yard was built to see how a small layout could be structured. 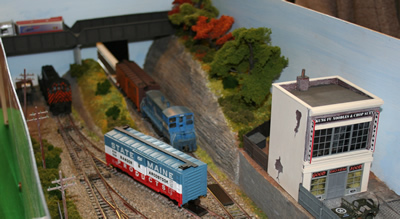 The overall measurement is 22" x 8" the scenic section of the layout measuring 16" X 7". Operation involves 5 wagons - 2 in the hidden siding and 1 each in the front sidings. Each wagon is represented by a playing card; the cards are shuffled and dealt out, indicating the location that the wagon should be.shunted to. 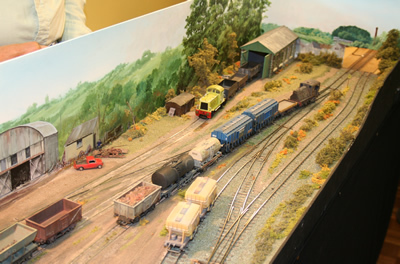 When the wagons have been shunted to their chosen locations, the process is repeated. During the course of the day to ring the changes, I have two sets of stock. First pre-B.R. days, using a Brighton Terrier and private owner wagons. The second early B. R. using an 08 + 04 diesels. Glaslyn Junction is my attempt to portray the beautiful Cambrian Coast line in Wales in the 1950s and 60s. It is a fictitious place, set somewhere in the Porthmadog area and features a typical Cambrian line wooden trestle bridge. The branch line leads to another fictitious place, Caergwyddno, which is bound up in Welsh myths and legends! 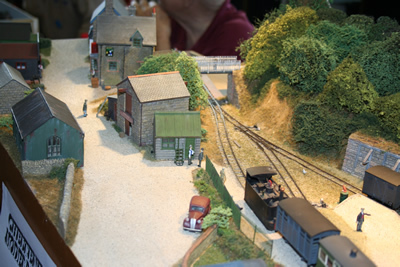 3mm Scale (formerly known as TT) is much under-rated these days, and I hope this layout shows its potential, being larger than N Gauge (2mm) but smaller than 00 (4mm), giving the modeller the opportunity to create a fair amount of railway in a reasonable space. The baseboards are constructed from plywood on a softwood framework and a cassette system is used in the "Fiddle Yards" at either end. The buildings and structures are scratchbuilt mainly from card or DAS modelling clay, and then painted with watercolour or acrylics. 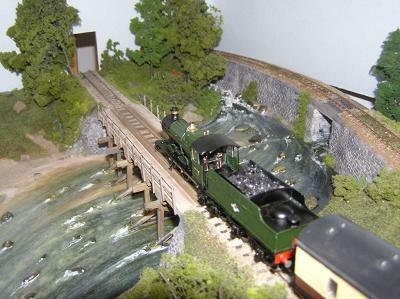 Scenery is by Woodland Scenics including the River Glaslyn for which their "Realistic Water" was used. 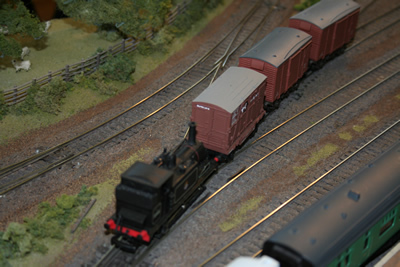 Locos and Rolling Stock are mainly kitbuilt and many can be obtained from the 3mm Society. The narrow gauge line here at Lower Peak Wharf comes from a far simpler time. Originally built as a horse drawn line to take the stone from the old quarry, off scene on the right, to the canal, off scene on the left. With the coming of a standard gauge railway nearby, this link was replaced with a new line linking the village and its quarry to the rest of the railway network and of course the greater outside world. In due course some carriages and other goods wagons were bought to better serve the local community, which of course was mostly employed by the Quarry Company anyway. Now, sometime in the late 1930's, the quarry has closed and the train runs a couple of times a week on market days to the nearby town. Most people still use the train, but one day soon it will be replaced by a bus and the line will become a part of our industrial history. Really I just wanted to build a small scene set in the style of building found in the Peak District, and shunt a few wagons around. One day I may build the canal wharf, but for now there is still much to do here. 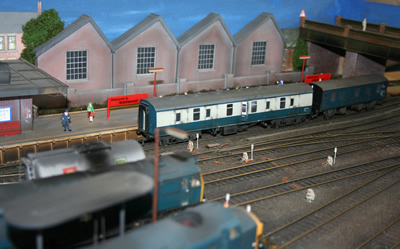 The model is built to 4mm scale with a track gauge of 9mm thus representing a line of 2' 3" gauge, in modelling terms generally referred to as 009. Lyndefeld is an imaginary small market town set somewhere in the mid-south of England near the coast. It is served by a branch off the South Western Main Line and has, so far, escaped the Beeching "axe". The line was originally conceived as a cross-country route to join the LSWR branch to Midhurst. As a consequence the station at Lyndefeld was built as a through station, although, in the event, the line was never extended beyond here. The branch generates a moderate train service for the locality with commuter services to and from Brighton and Waterloo, as well as connecting with the Western Region, with access to Reading. There is still a fair amount of freight, sufficient to warrant the retention of a small locomotive facility at Lyndefeld although the market these days provides little traffic and what there is, is mainly in the movement of sheep. With the "axe" of Dr Beeching hovering over the railways, the Lyndefeld branch is beginning to play host to occasional enthusiasts' excursions. 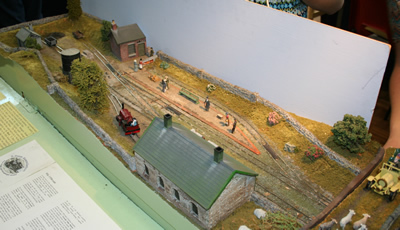 The layout was designed to demonstrate what can be achieved using mainly proprietary materials and built as a first attempt at an exhibition layout. The base-boards are constructed of 12mm MDF and chipboard on 2" x 1" softwood frames. All trackwork is PECO Streamline on a cork base and ballasted with "granite" chippings. Points are controlled electrically with Peco point motors. 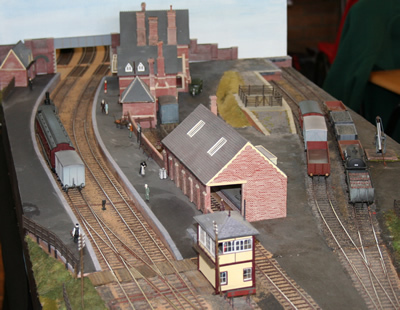 The station building, platform, goods and engine sheds, signal box, retaining walls and most of the bridge are constructed from Wills kits and materials, whilst Woodland Scenics materials have been used for landscaping. 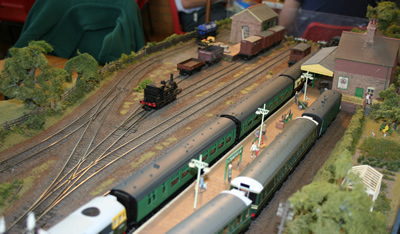 Most of the trees on the layout have been constructed from twisted wire. The layout was principally built to fit into a spare bedroom 9' 6" x 7' 3" and is, therefore, L-shaped. It is, however, also designed for exhibition purposes to appear in one length of 17' 3", depending on the space available. Maidens Dale is a fictional location somewhere in the Midland Region in the 1960's era. The layout was originally an end to end design started in 1986 and has been extended over the years to an oval now measuring 11' x 6' 3". Peco code 100 track is used throughout with points activated via the electric pencil method, using Peco point motors, with a capacitor discharge unit. The track is split into 5 sections and the fiddle yard has 16 tracks, the trains are run in turn and controlled by 2 hand held A.M.R's. 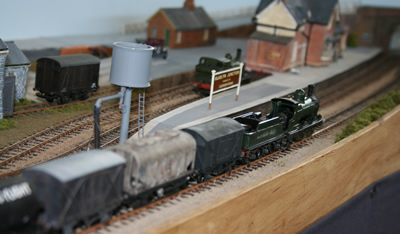 The stock is mainly ready to run with steam and diesel, there are a few kits and conversions. The signals are made from odds and ends of Ratio kits and operated by piano wire. The scenery is made from carved polystyrene and chicken wire over the tunnels, covered with strips of glued newspaper, then Polyfilla painted brown, then scenes glued on. The water is made from Bonda clear casting resin with layers of yacht varnish. 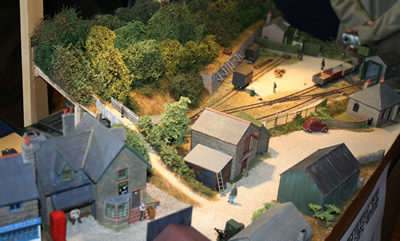 Most of the buildings are scratch built using Slaters Plasticard, many of them are copied from photos of real buildings with detailed interiors and illuminated. 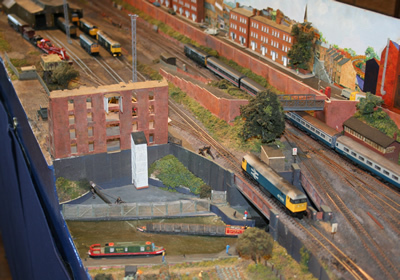 Set in the early 1980s, the layout represents a terminus station in a fictional large town south of Birmingham, close to the boundary between the Western and London Midland Regions of BR and connected to the Bristol-Birmingham main line by a triangular junction near the real life station of Kings Norton. The town is large enough to warrant regular calls by Inter City cross country trains, together with loco-hauled trains on provincial routes and DMU services between Worcester and Birmingham. 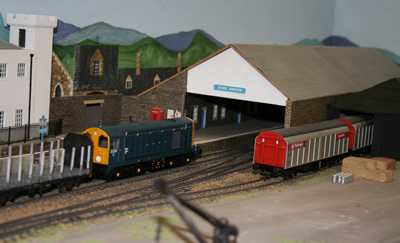 The depot provides servicing facilities for freight locomotives allocated to Bescot shed, and passenger locomotives laying over from their duties. 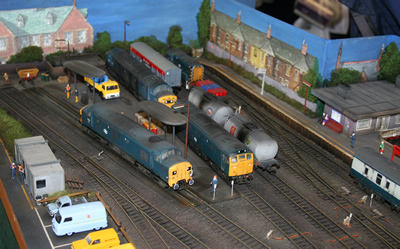 Operation is based upon the timetable ruling during 1982 and mainly features blue diesels (for which the layout's owners have a soft spot! ), although a few 'oddities' may appear from time to time. 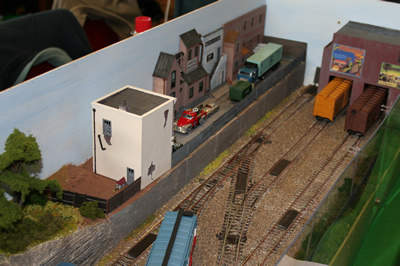 Buildings are either scratch-built or modified kits, the track is standard Peco N gauge, and the rolling stock is mainly from the Grafar range. Marcroft Wagon Works in Radstock remained open until 1988 and changed little in appearance over the years. 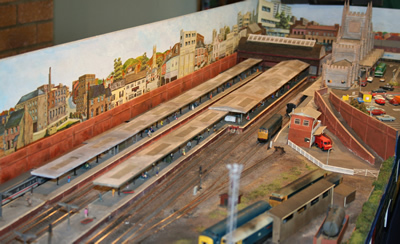 The layout is depicted after the reworking of the site in 1962, when the 4-road repair shed was extended. At this stage the through line to Frome had been closed but not lifted. 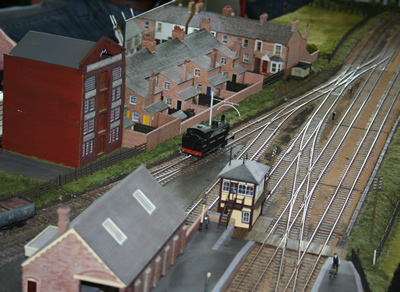 All trains into Radstock GWR came from the Bristol direction as depicted in the model. In 1968 severe flood damage to the line at Pensford resulted in the Bristol connection being closed and the line to Frome being reopened. All of the buildings are scratch-built from photographs and all of the stock used is fully detailed and weathered. 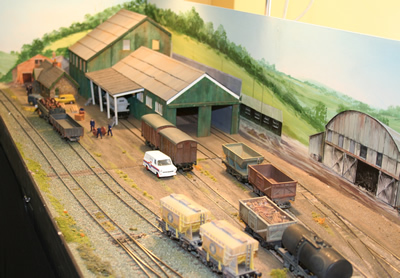 The works shunters are depictions of those around the Radstock area, as Marcroft used a shunting tractor which proved impossible to build and motorise. I live in a small house where space is at a premium. After consultation with the domestic authority, it was agreed to my having a layout, provided it wasn't too large. After much scribbling and searching, this is the result. The model represents a shoreline somewhere in the fruit growing area along the Pacific coast of America. The Fruit Packer in the small town of MICRO own the line. As the line only operates in the fruit picking season, all locos and rolling stock have been purchased second hand. All stock has been fitted with Kaydee couplers for hands off operation. All the buildings are scratch built copied from pictures in magazines or books. Shell Bridge is now the terminus of the Fort Augustus branch that closed in 1947 but the small branch to Sheil Bridge survived. This is due to increased freight levels of timber and paper traffic and the maintained flow of traffic to the near by Royal Navy base in the next glen along a short freight only line. 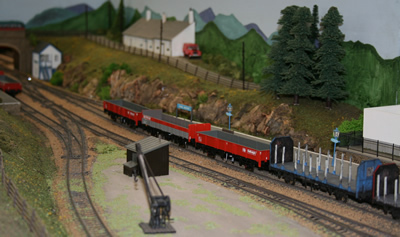 Passenger traffic is just viable loading to three coaches during the summer with services starting from Spean Bridge. 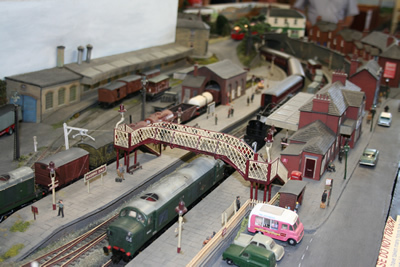 The layout is based on the late 1980s to the early 1990s and also operates in the modern period. Ty Bach is assumed to lie about one mile due south of Talyllyn Lake, up in the mountains. For Ty Bach to exist we must assume that the connecting railway between Abergnolwyn on the Talyllyn Railway and Corris on the Corris Railway, was in fact built, creating a through line from Towyn to Machynlleth, through the scenic mountains. Above the village of Corris Uchaf (Upper Corris), we must assume that there is a junction with a branch running west to Ty Bach. The branch was built to serve the slate quarries of Glyn Lago and Darren. Both are real quarries, but neither was successful. Glyn Lago was not much more than a trial and is now lost in forestry, while Darren did produce but was unable to transport its undesirable rustic produce to market, relying solely on the packhorse. The quarry is notable, however, for its Hand Powered Circular Saw. The name Ty Bach comes from the Quarry Managers House. According to the locals, the unpopular English quarry manager wanted to call his cottage, the Big House. The Welsh quarrymen weren't having this and insisted that the name had to be in Welsh, and informed him that the translation was Ty Bach. Ty Bach is actually Little House, and usually refers to the little house at the bottom of the garden. It was a while before the manager found the true translation of Ty Mawr, and by then it was too late, the original name had stuck. When the railway arrived, it took the station name from the nearest house, the managers house, Ty Bach. The station is some distance from either quarry. 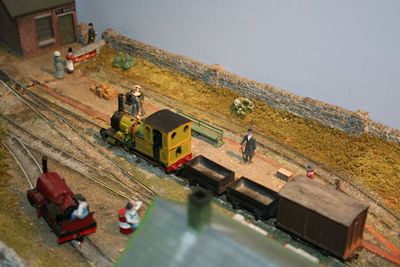 Darren is reached by a 2ft 3ins tramway from the station, and has its own locomotive, Glyn Lago is served by a 3ft 6ins horse worked tramway, using second hand equipment from Duffryn Nantile. Track is hand built in an attempt to portray poor quality trackwork. Scenery is plaster on a foam bed, covered with various scenic scatter materials. Rolling stock is mainly kit built with kits from Malcolm Savage Models and loco chassis from Mike Chinnery, there are a few adapted vehicles as well as a few scratch built wagons. Most of the buildings were built by Peter Leyland.